Careful painting makes for a lovely kitchen. We got good news on the project. 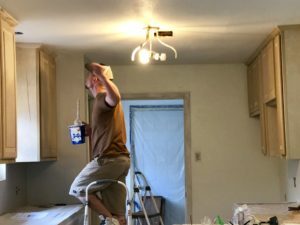 The interior painting is wrapping up, and they are ready to paint the cabinets and build-ins. The family room built-ins get new doors, which will help them a lot, we think. We watched Carl the Cutter as he cut in the edges between the wall and ceiling in the kitchen. Lee remarked that he had a very steady hand. His feet are pretty steady, too. 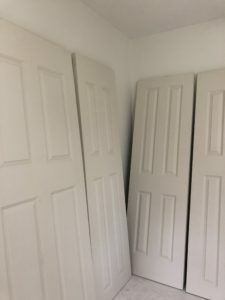 Nice looking doors that will add some texture and interest to the exterior. Once all the interior painting is finished, the lighting will go in and the exterior will get refreshed. Most of the trim is going to look a lot lighter, but the dark red accent trim that matches the brick will really pop. We decided to paint the garage doors the same color as the doors and shutters, which should look very ice. Yes! All the white four-paneled interior doors are in, and they are going to really dress the house up. I’ve always said that the hollow luan doors are a sign of corner cutting (or a tight budget! ), so these will really upgrade the space, as will the new front door. Where the two cool and neutral wall colors meet. Nice. 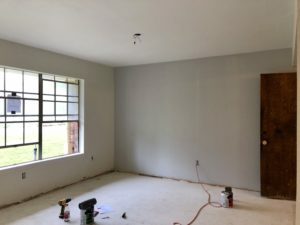 One more thing I’d wanted to check on this visit was how the gray accent wall looked when it met the neutral main wall color in the dining area. It’s subtle, but looks pretty good to us. However, that lack of contrast made us re-think the color to paint the living room built-ins. We asked Cody to select two shades darker of the same gray, so it would be more distinct. Let’s hope that works out! Now we just need to find a backsplash tile that blends with that color and the granite and select flooring (that’s the last thing to go in). Jennifer and I had considered going to look for it in Temple over the weekend, but since monsoon rains and pretty impressive flooding struck both days of the weekend, we put it off for a week. It’s always nice to have something fun to look forward to!